With the start of school right around the corner, I decided to revisit a post I've done on sites for educational games. This list, presented in alphabetical order, has a nice mix of subjects and grade levels that teachers can use with their students. ABCya - A great site for games and mobile apps for elementary students. Academic Skill Builders - A wonderful site with learning through the use of multi-player games. Also, there is an educational portal which allows for student tracking. Arcoiris - A nice site for educational games in English and Spanish. Braineos - Games based on flash card in a wide variety of subjects. BrainNook - A fun site for students that focuses on English & Math. Also, there is a teacher portal with lots of resources for educators. Bubbabrain - Lots of game for all grade levels that allows teachers to create games too. Cackleberries - A virtual world filled with educational games for kids 3-7 yrs old in a safe environment. Clever Island - Excellent games for kids 3-8 yrs old in a wide variety subjects such as: Math, Reading, Spelling, etc. Cookie - A great site for educational games and teacher resources. Creativity Games - Learn through the use of creativity brain training games. Creating Music - A fun site for learning music through the use of educational games and other online activities. DimensionU - An innovative site for learning math in a 3D virtual world. Fish Smarty - Excellent site for online learning through the use of educational games. There is an educational portal for student tracking as well. Fuel the Brain - A wonderful site to learn elementary skills such as math, science and reading. Lots of educational resources too! Funbrain - One of the most popular sites for educational games for kids K-8 yrs old. Funschool - A wide variety of games, activities, and videos for kids. Game Classroom - Games for students K-6th grade in math and LA with lots of resources such as: worksheets, videos, and more. Gamequarium - A popular site with lots of games in a wide variety of subject areas. GameUp - A innovative site from the creators of BrainPop where the games are based on their interactive animated videos. Kidz Page - A fun site for educational games PreK-8th grade. Learning Games for Kids - A great site for educational games on lots of different subject areas. Lure of the Labyrinth - An innovative game for middle school pre-algebra students. 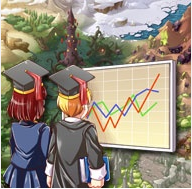 Magnahigh - Math games for K-12 with educational portal. MinecraftEdu - A unique game based on the popular PC designed for schools. PhyFun - Physics-based games for all grade levels. Pipo Games - A nice site for educational games for ages 3-12 yrs. A paid site unlocks all the features. Play Brighter - A fantastic site filled with educational games on a wide variety of subjects, built on its unique anime style interface. Play Kids Games - A fun site for educational games in subject areas such as math, vocabulary and geography. Power My Learning - A great all-in-one site for education filled with games, videos, resources and more. Sheppard Software - A nice site with lots of games on different subject areas. Skoolbo - Wonderful educational games for core skills in the primary grade levels. Spelling Connections - A cool site for spelling and vocabulary games with educational portal. Teaching with Portals - A very innovative game based on the popular console/PC game Portal, with lots of lesson plans to be found. Tucoola - A great site for skill-building games for the younger kids with student tracking. Tutpup - A cool site for math and spelling where kids compete against each other. Vedoque - A nice site for educational games PreK - 8th grade. What2Learn - A excellent site for educational games where teachers can create games and track students with a paid account. Yogome - A great site/company with lots of innovative games and mobile apps on recycling and more. Zondle - Interesting games that support learning and can be embedded into a site. ZooWhiz - A fun site for kids 5 - 15 yrs to develop Math and Reading skills by creating their own virtual zoo. For my Pinterest board on educational games click here.